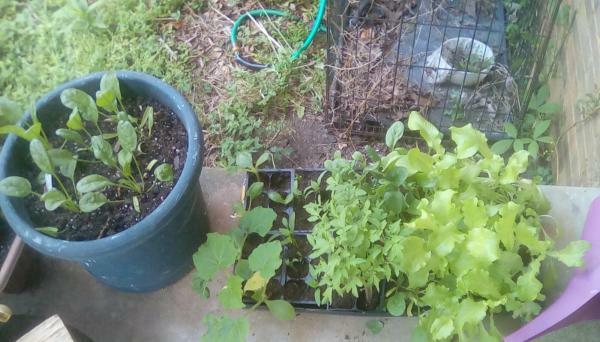 A short while ago I planted some spinach and lettuce for my fishies and WOW - they're already outgrown the base planter and need to be replanted. This is my first year with fish AND any plants and I can say that the fish water used instead of fresh water makes a HUGE difference. Yay? Yes, that's what aquaponics is all about. I've been putting the tank water on our hibiscus bushes, dwarf cherries & grape vine, & they are thriving! Yeah, when I siphon from my main tank, I siphon it out into the back yard and I have to change the hose location around each time or else one patch will grow much faster than the rest! When I do water changes on my beta tanks, I use that water on my indoor house plants Natural fertilizer!